We just came back from a few days in Mexico City. It was our second visit...the first time we were there, about a year ago, I was completely surprised by it. It has fantastic areas for walking. It's a place for exploring, way beyond the wide array of museums, many of which I have yet to visit. The galleries are set in unique spaces that are a far cry from the classic white box. There are exceptional restaurants. Every block offers a combination of saturated color, interesting textures, vitality, and history. Aside from historical photos, I've taken all the photos on this post (except as noted). I look forward to returning to Mexico City soon. These figures above and below embody some things I love about the city. The creative use of stock construction materials, the entrepreneurial energy of the city, the art of making something from what might be detritus. (If you've seen my post about community gardens in NY you'll know how much of a draw that is to me!) This group of brick figures has so much gusto. The artist is Ramiro Chaves, and I came across his work at the Material Art Fair, the first in the city dedicated to emerging practices. He's represented by The White Lodge. 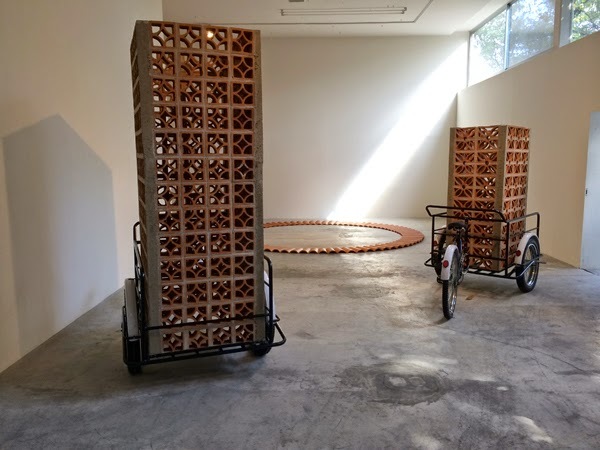 Chaves has done a body of work on the political and psychological importance of the letter X in Mexico, a symbol of pride, so these figures refer to that as well as other ideas. 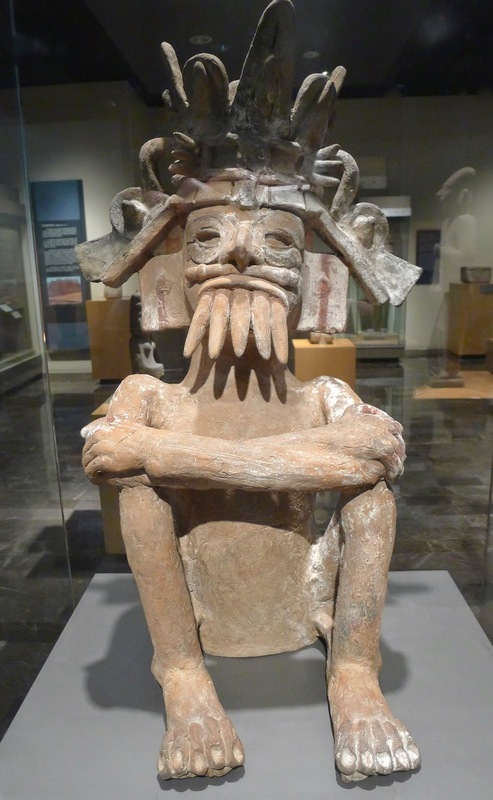 The work also makes a connection for me with pre-columbian and pre-hispanic figures we saw at the Museum of Anthropology and at Diego Rivera's Anahuacalli Museum in Coyoacan. 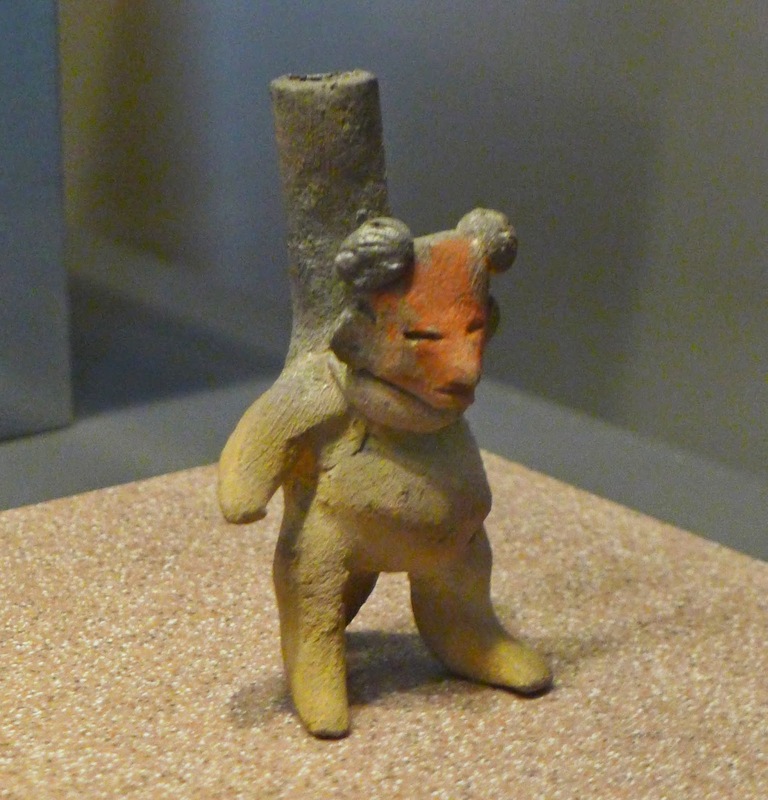 Above: A figure at the Anahuacalli Museum. 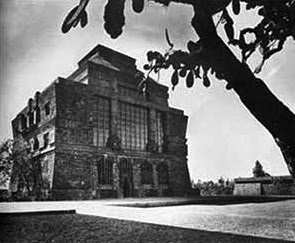 Above: Diego Rivera displayed his private collection at this museum he built in collaboration with architect Juan O'Gorman. At the time of Rivera's death in 1957 it wasn't finished, but his patron Dolores Olmedo and Rivera's daughter Ruth Rivera Marin took over the work with O'Gorman to complete the building as Rivera had planned. Rivera was able to see the lower floors done. 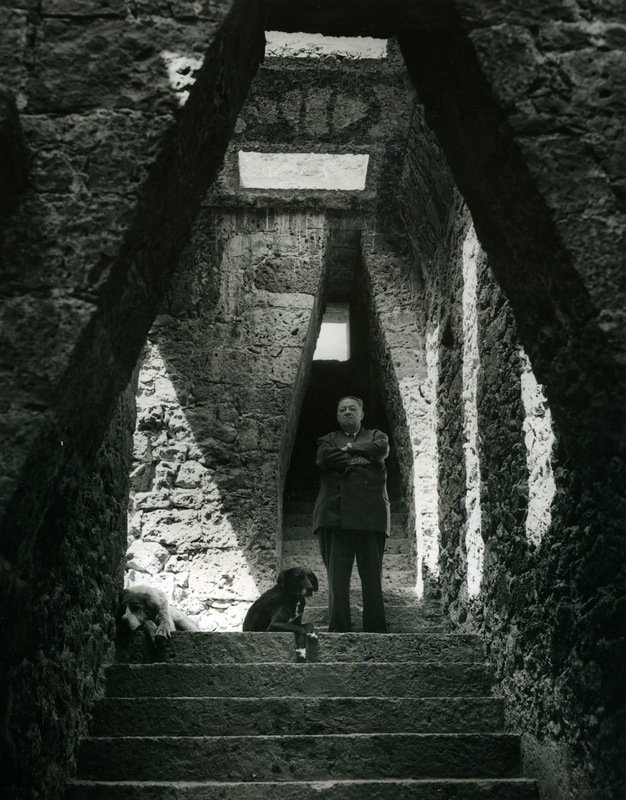 Above: Diego and one of his dogs inside the museum. 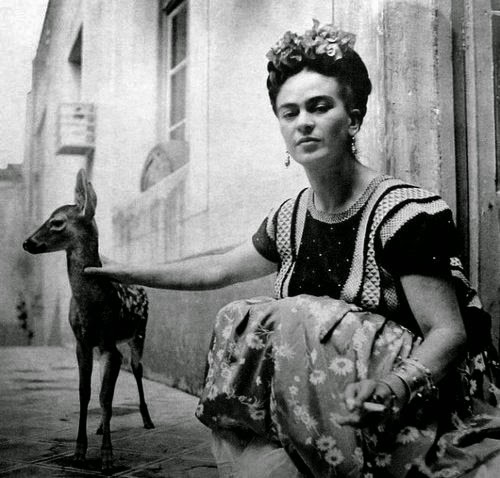 Photo from the Diego Rivera and Frida Kahlo archives found here. The museum is built on a lava field, and they used the local lava to create the blocks of stone that make up the building. The city donated the land on the condition that Rivera would build the museum and make the collection accessible to the public. Above: Pieces displayed on the first floor. The first floor was intended as the underworld...the only light comes through translucent amber onyx. Above: The 2nd floor was intended as the realm of the living. This space houses Rivera's sketches for the Rockefeller Center mural, with more displays in rooms around the perimeter. Photo by Deborah Caplow, found here. The Rockefeller Center mural was infamous for having included a large portrait of Lenin. Rockefeller had the mural removed to loud protest. E. B. White wrote a satirical poem about the issue, "I Paint What I See", which was printed in the New Yorker on May 20 1933. 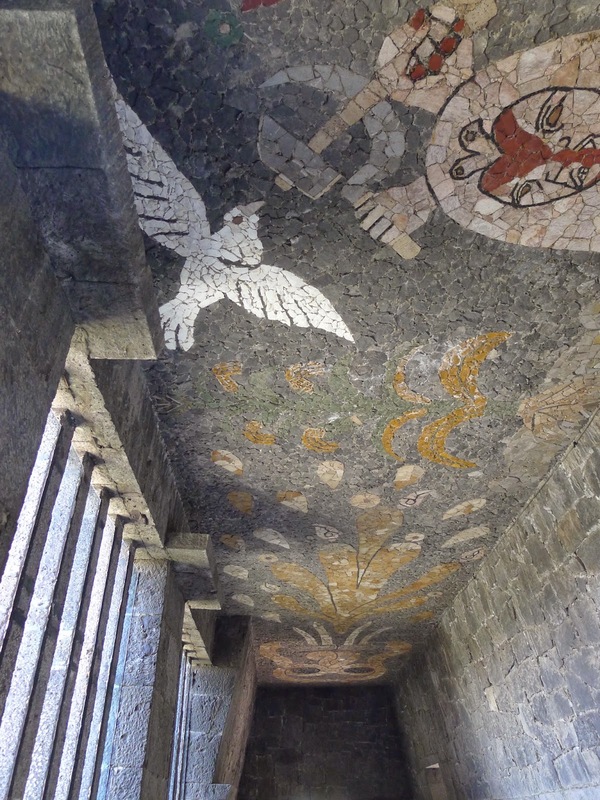 Above: All the ceilings are faced with stone in large scale mosaic patterns. 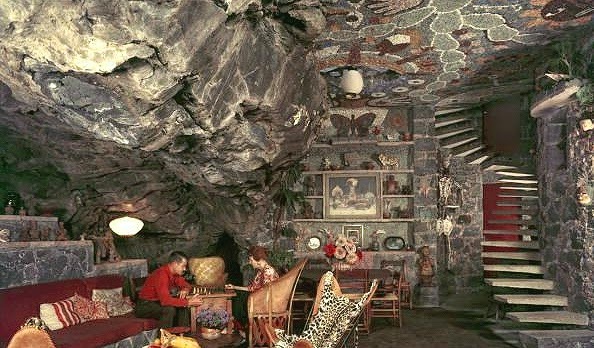 Above: In Juan O'Gorman's house he took advantage of a natural lava stone cave, and in adding on used the same technique on the ceiling as in the museum. This house was demolished in 1969. 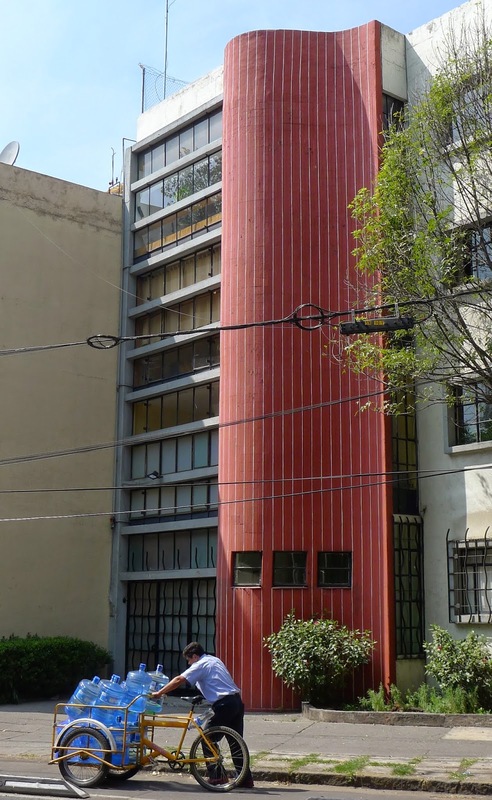 Juan O'Gorman may be best known for the studios he built for Diego Rivera and Frida Kahlo in 1931. 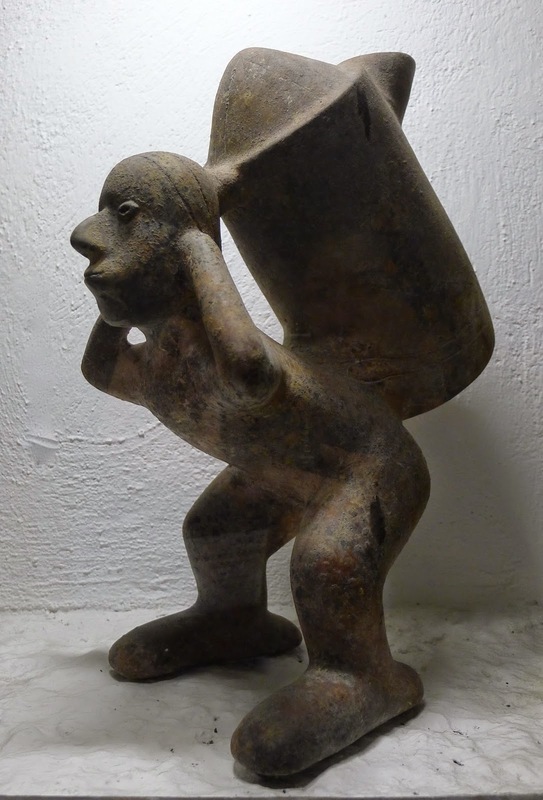 At the time he was heavily influenced by Le Corbusier. 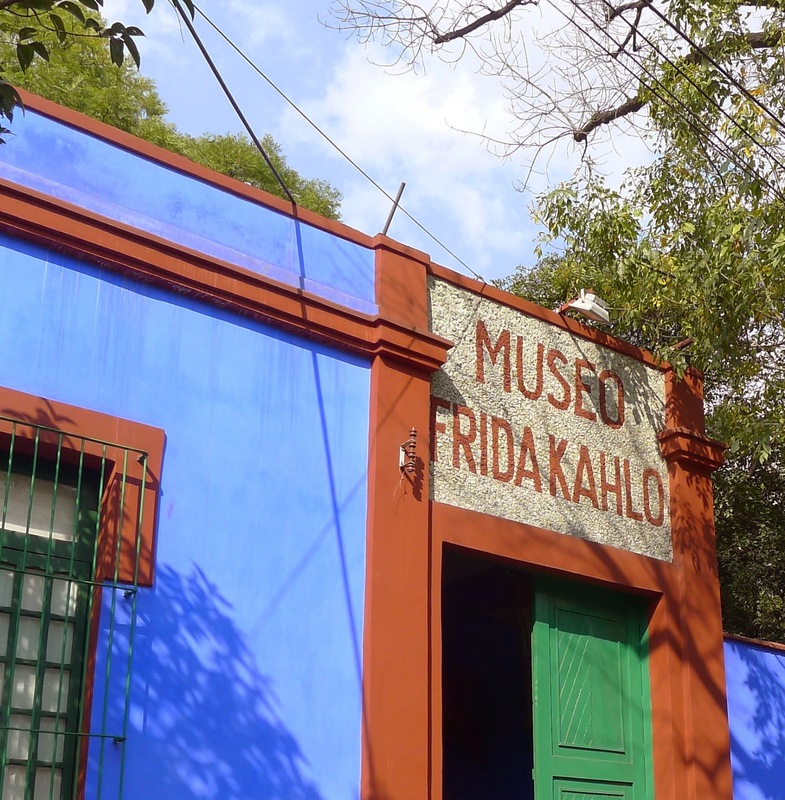 The blue building is Kahlo's studio, and the terra cotta is Rivera's studio. 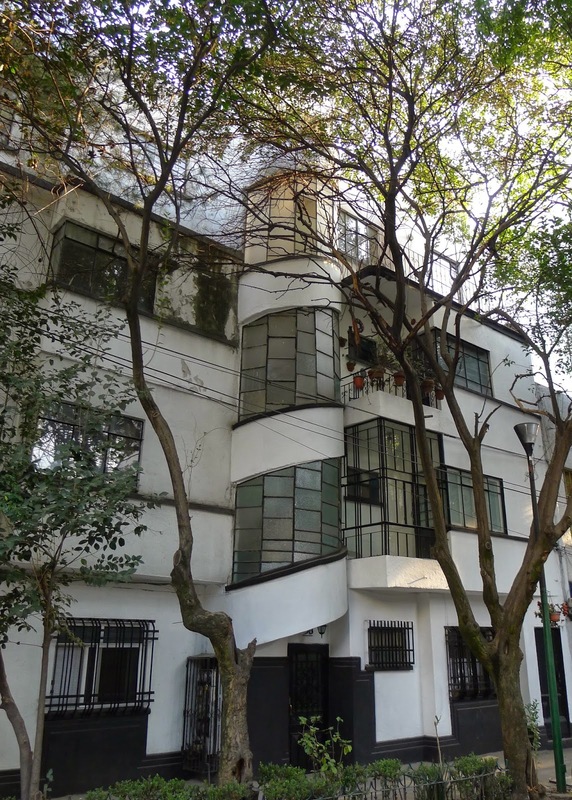 They lived together there as well, though Kahlo spent part of her time at her home, the Casa Azul, nearby in Coyoacan. Above: Kahlo's space linked by a bridge to Rivera's. Above: A detail of a mural by Rivera, showing him as a child in the foreground with an adult Kahlo behind him. 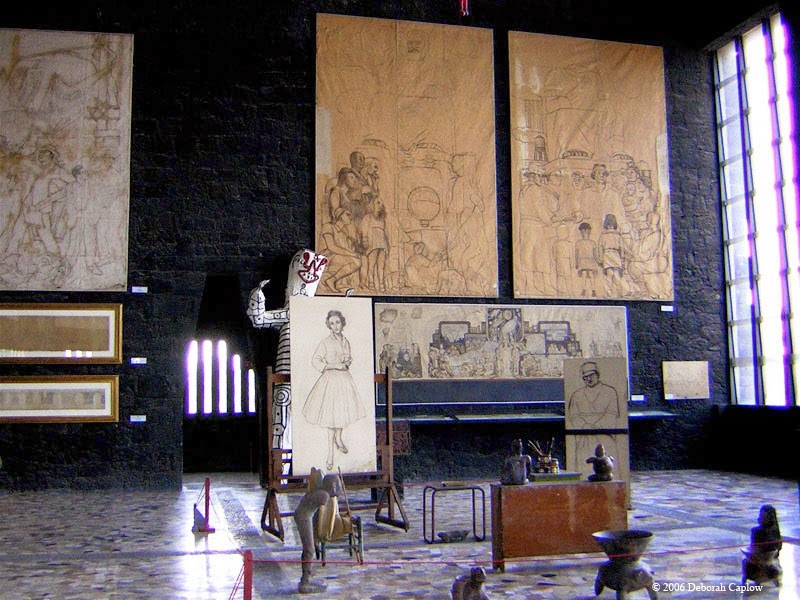 The mural is displayed at the Museo Mural Diego Rivera. 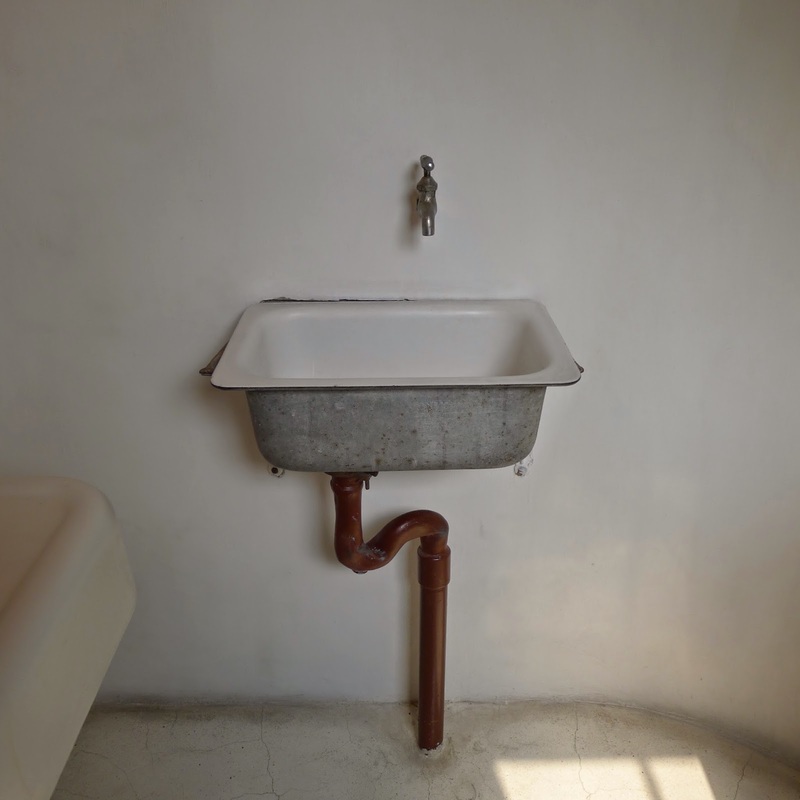 Above: A subtle balance between spigot and drain. Above: A place for Kahlo to rest her head is built into the design. 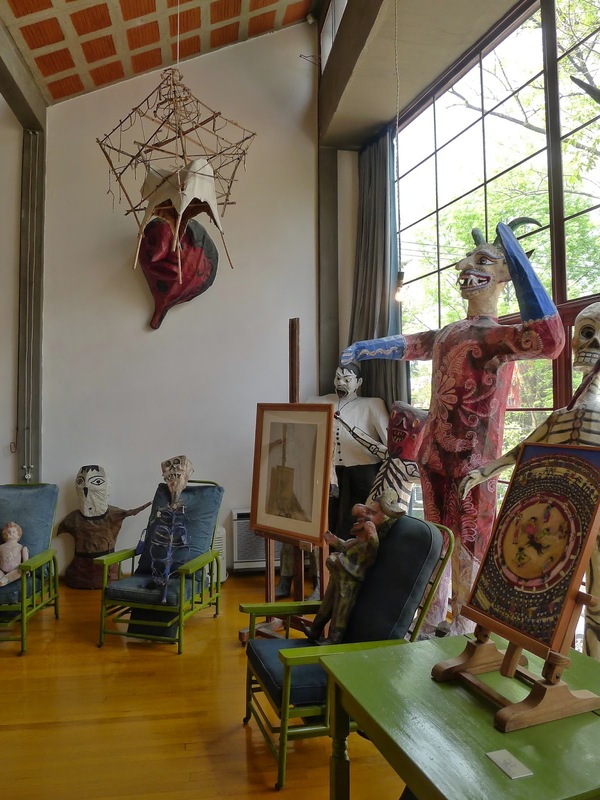 The studios are in an outlying part of Mexico City called San Angel. 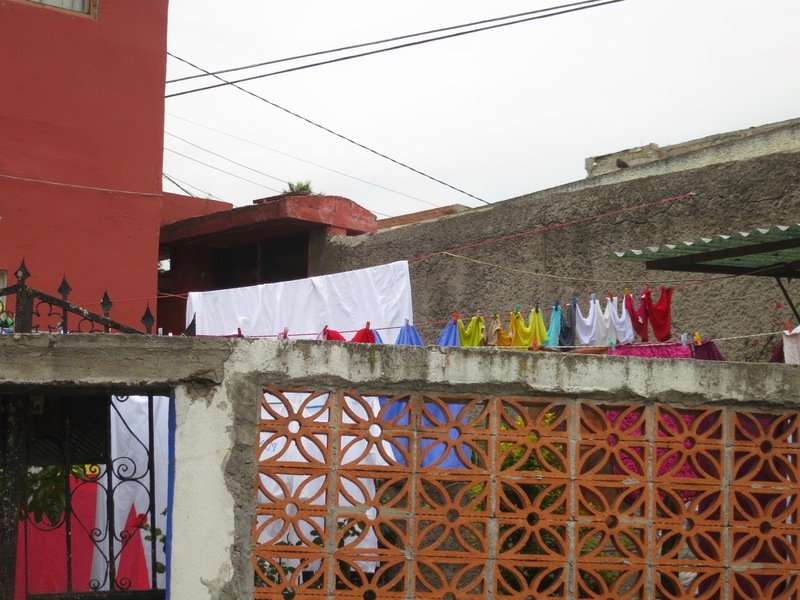 It was a separate village in Diego and Frida's lifetime...now the city's sprawl has grown out and enveloped it. It's still a beautiful area with lovely old homes and cobblestone lanes. 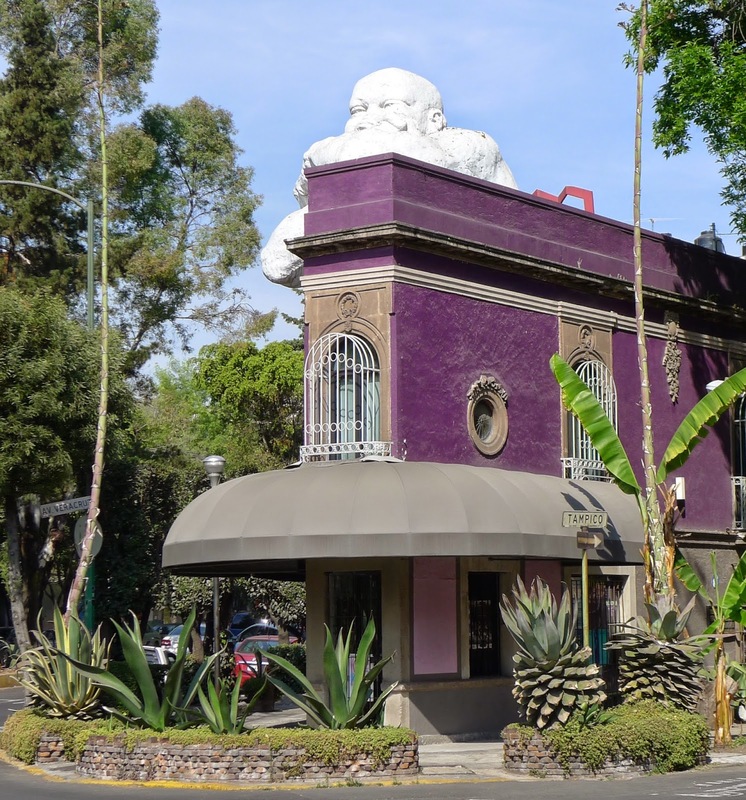 Across from the studios is the San Angel Inn, a place famous for leisurely Sunday brunches. Pictures below were taken behind the Plaza San Jacinto on a Saturday afternoon, where we wandered away from a crafts market in the square called El Bazaar Sabado. 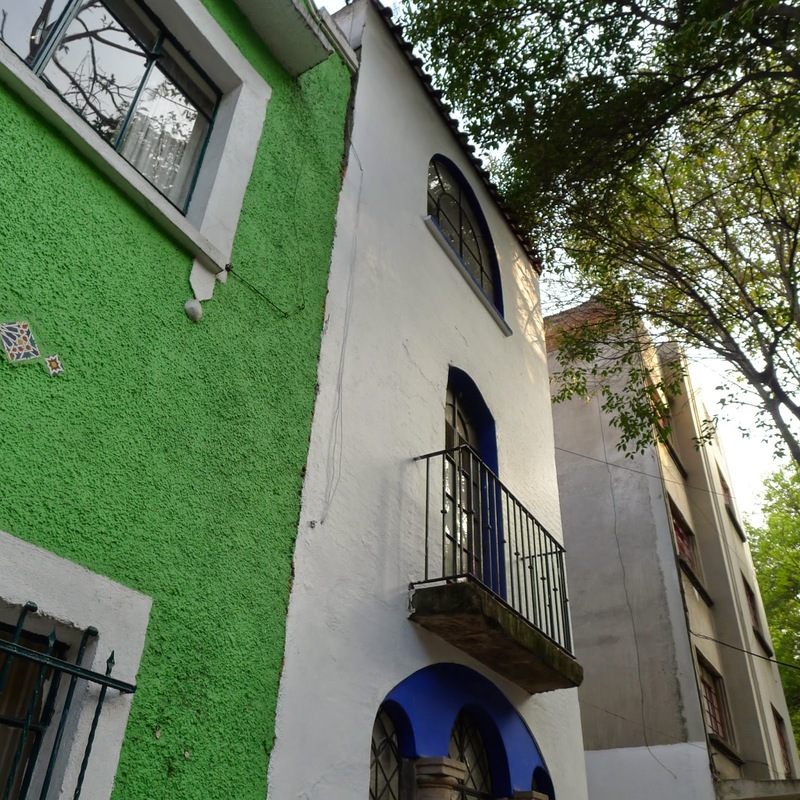 Frida Kahlo's home, the Casa Azul is in Coyoacan, near the market. Kahlo grew up in this house. The house was built in 1904, and she was born here in 1907. 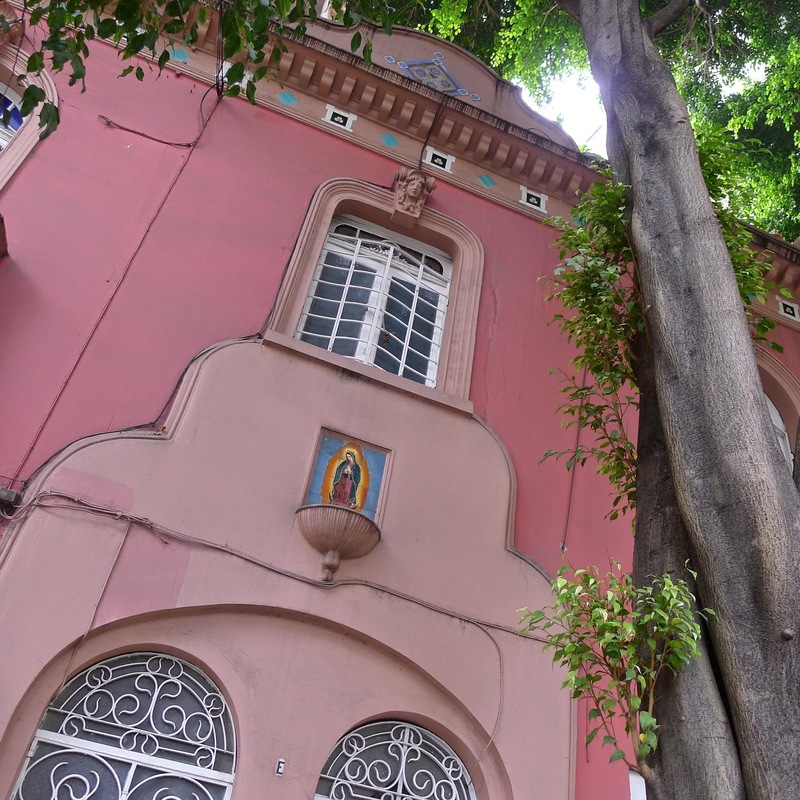 It's in a part of Coyocacan called Colonia Del Carmen. 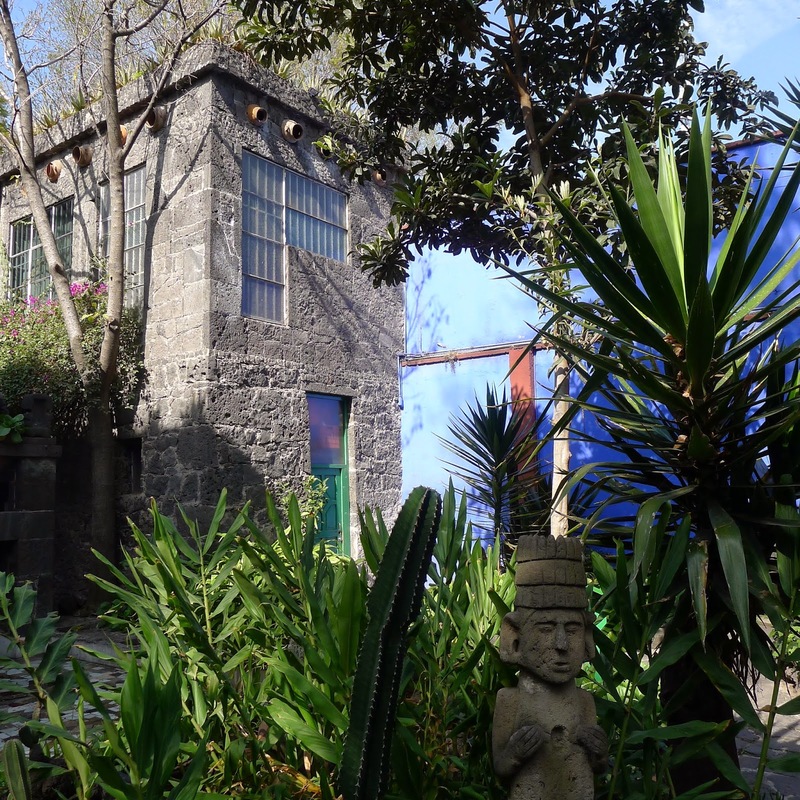 Above: This shows the newer part of the house, a lava stone addition designed by Diego Rivera and Juan O'Gorman in the 1940s, next to the original house painted blue. Above: The kitchen..the writing on the wall is made from tiny teacups. Above: Kahlo's studio overlooking the garden. It's housed in the lava stone addition. Above and below: Kahlo contracted polio when she was 6, leaving one leg shorter than the other. When she was 18 she was spiked through with a metal rod in a trolley accident. She spent most of her time in a wheelchair or in bed. She had two beds...one for daytime shown above, where she faced a mirror, and one for night time below where she faced a panel of butterflies, and had a skeleton above the canopy. She painted in bed frequently, and I believe the mirror enabled her to paint self portraits. Above: Frida Kahlo is known for her incredible style. After she passed Diego locked her clothes away to protect them, entrusting his patroness Olmedo to keep them secure for another 15 years. 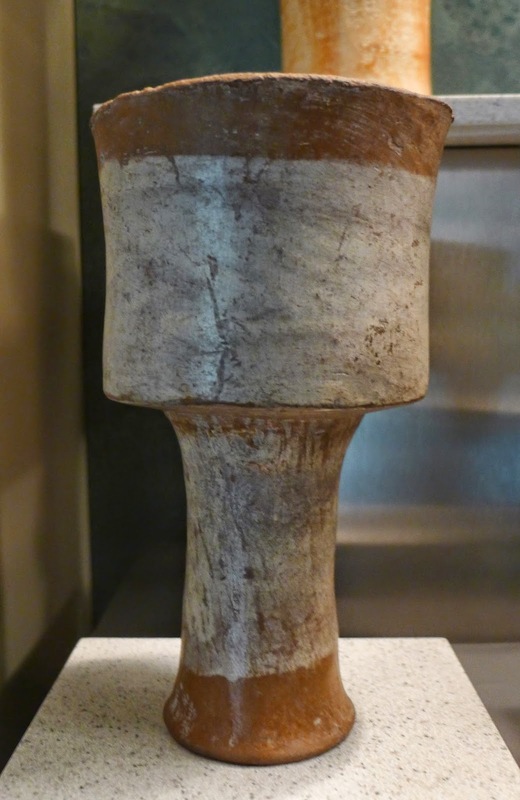 In fact it was only upon Olmedo's passing that the collection was opened, and a couple of years ago it went on display at the Casa Azul. You have a very heavy headpiece made with pleats and flowers and ribbons, so the adornment is concentrated around the head. Then you have the huipil, which is a short blouse, usually accompanied by a lot of jewelry, and finally a long skirt. 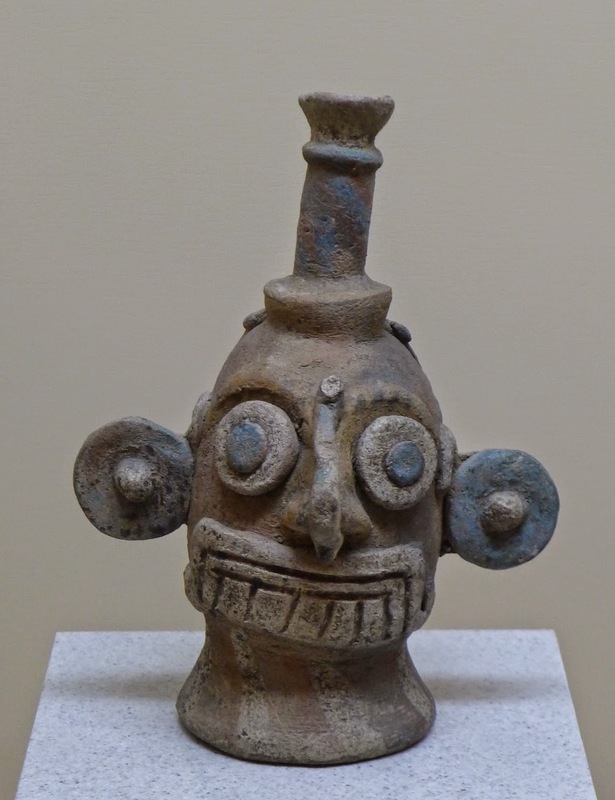 The Tehauntepec Isthmus is a matriarchal society, so that means women dominate the culture; they administer the society. 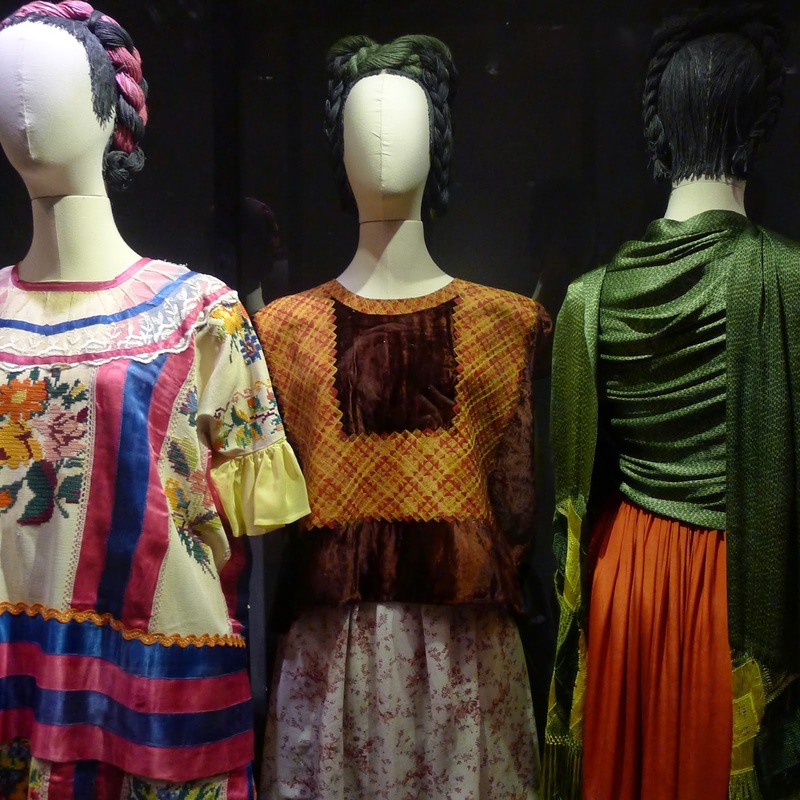 Frida Kahlo didn't just choose any dress from Mexico. She chose a dress that symbolizes a very powerful woman. This way of dressing focused all the decoration on her upper body, with the headpiece bringing attention to her face. Her damaged legs and protective corsets were hidden under the long skirts. 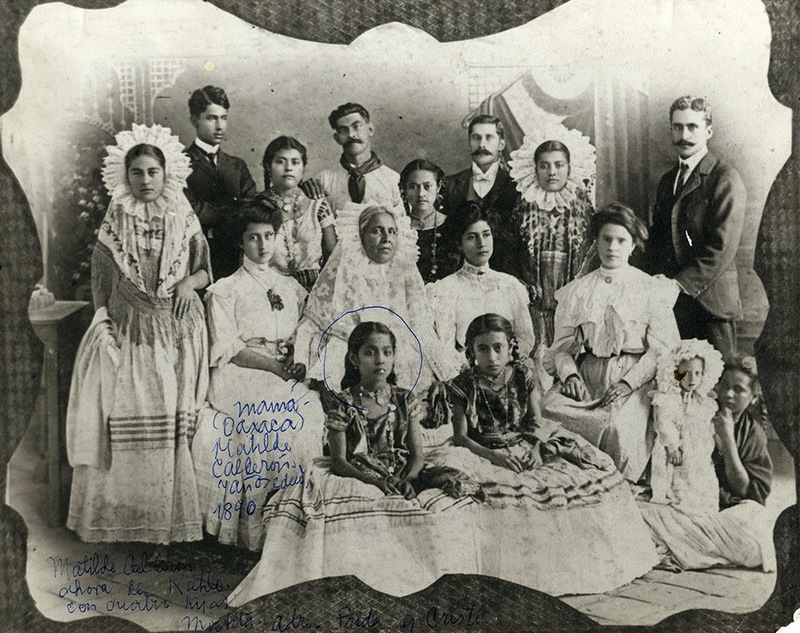 Above: A photo of Kahlo's mother's family all shown wearing the traditional Tehauana clothing she favored. Her mother is circled. Above: Kahlo in Tehauana clothing. Below: A blue wall in the garden. 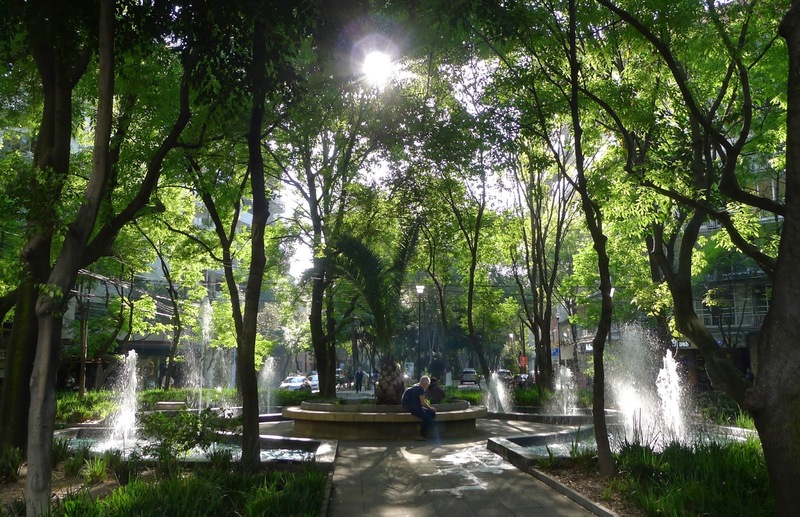 Back near the center of Mexico City is the neighborhood of Condesa. It's a wonderful area for walking...very lush, with two large parks, and long avenues with tree lined paths down the center. such a variety of beautiful architecture... French Neo-Classical, Art Nouveau, Spanish Colonial, Deco, Bauhaus inspired, Modernist, as well as contemporary. Avenida Amsterdam is at the heart...a circular street that was created where a race track had been, it makes a ring around Parque Mexico. It has a central path with beautiful planting on either side, and fountains interspersed at round-abouts. 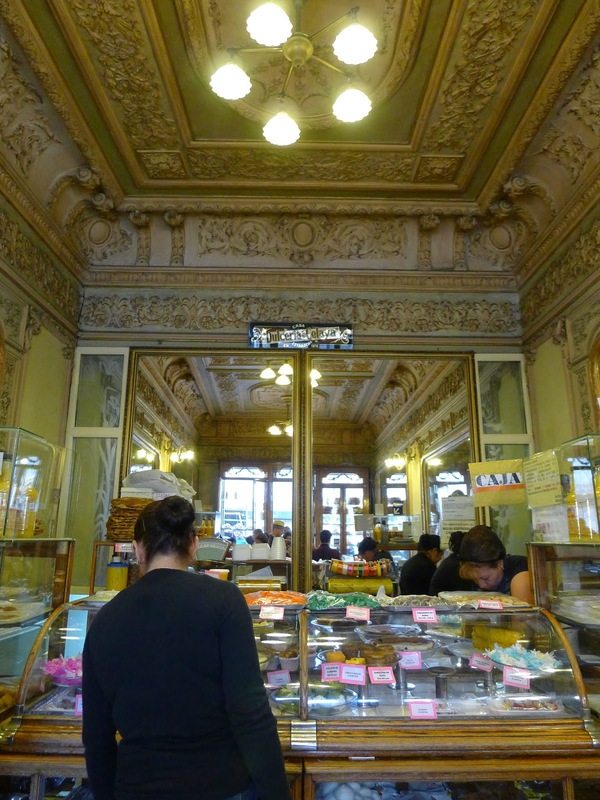 Above and below: Maque, A favorite breakfast spot (and bakery) across from Parque Mexico. Below: On the inside of the Avenida Amsterdam loop is Parque Mexico, and on the north west side is Parque Espana. A meeting place for dog walkers, we saw the dogs relaxing while the walkers took a lunch break. Above and below: In the winter the lakes are drained, but the structure that's revealed has its own appeal. 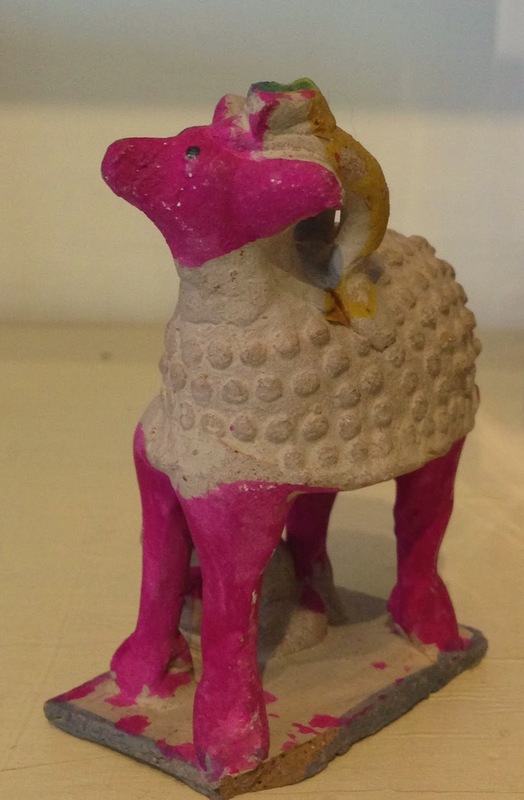 A ceramic alligator enlivens the handrail. Above: Part of a playground area in the park. 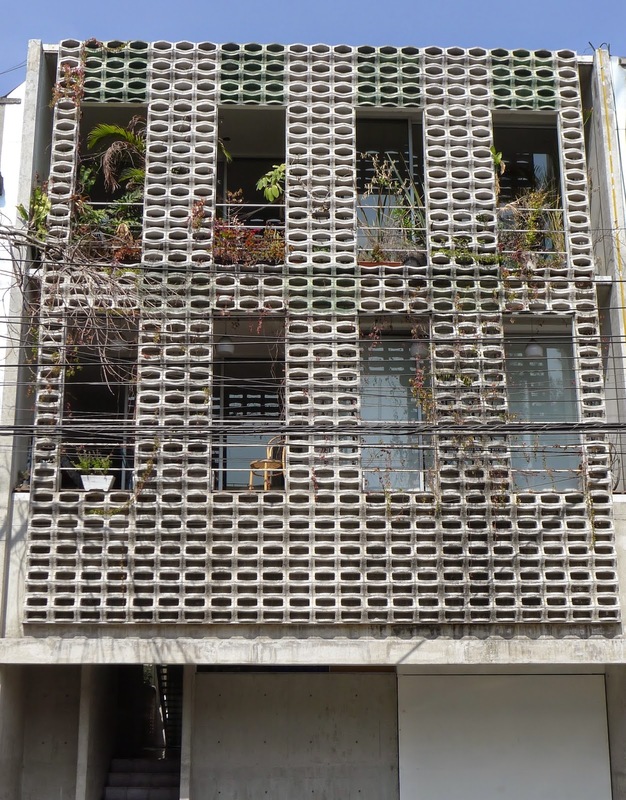 Above: Across from Parque Espana an interesting treatment on a modernist apartment house. 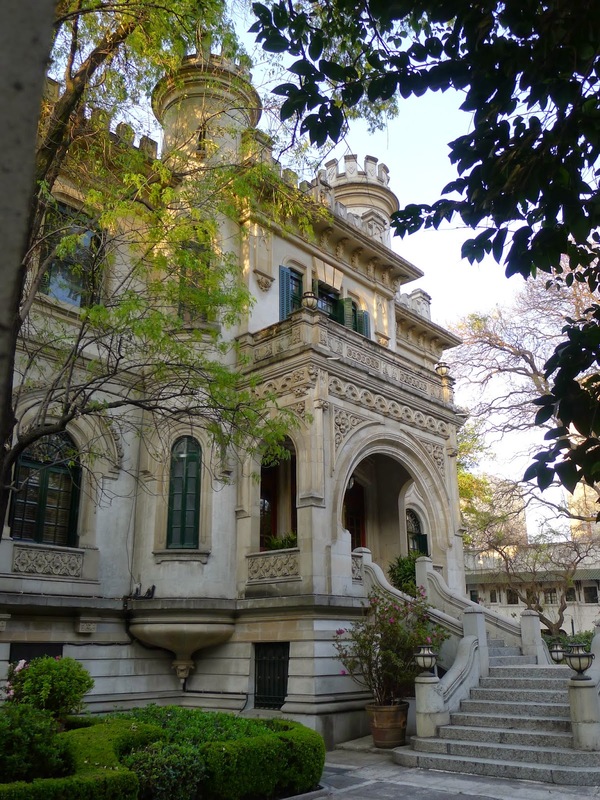 Above: Also across from Parque Espana, is this elegant mansion that houses historical archives. Above: Nearby a genie overlooks the street. Above: An apartment building on another lovely boulevard with a park pathway down the center, Avenida Mazatlan. Above and below: Interesting use of architectural elements. 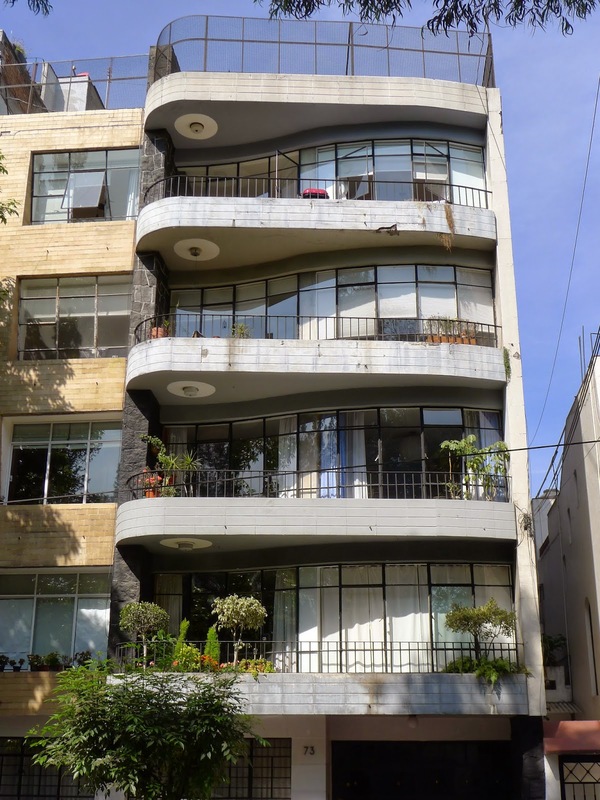 Above: A popular place to stay, the Condesa DF. It has a stylish roof bar with beautiful views of the neighborhood. 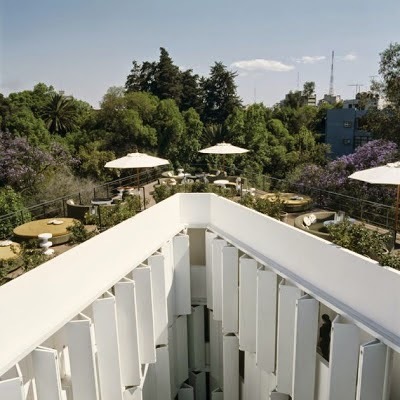 Above: A view of the Condesa DF rooftop bar and the interior atrium. (courtesy of the hotel). 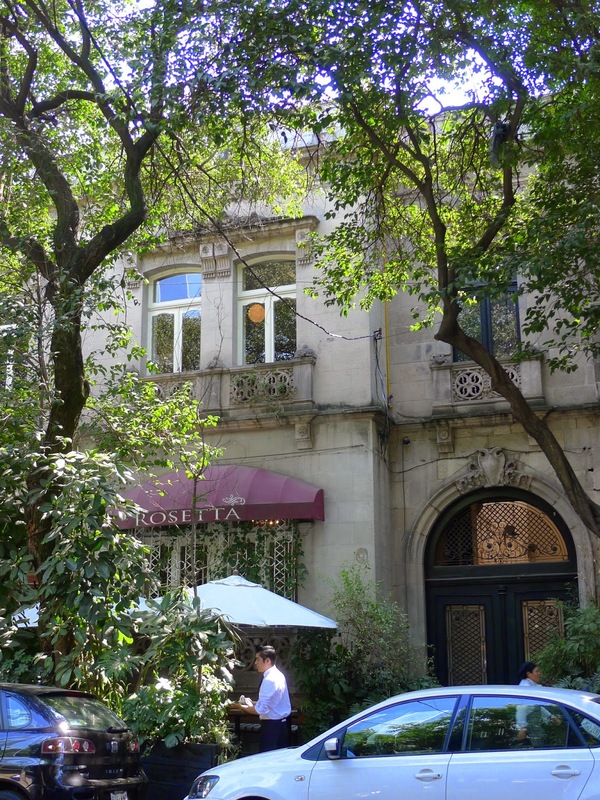 Above: Around the corner on Colima Street is a lovely small hotel, the Villa Condesa. Heading north on Colima Street leads you into Roma Norte. Condesa and Roma Norte have a similar character, but Roma Norte has more restaurants, shops, and galleries, and Condesa is a little more residential. 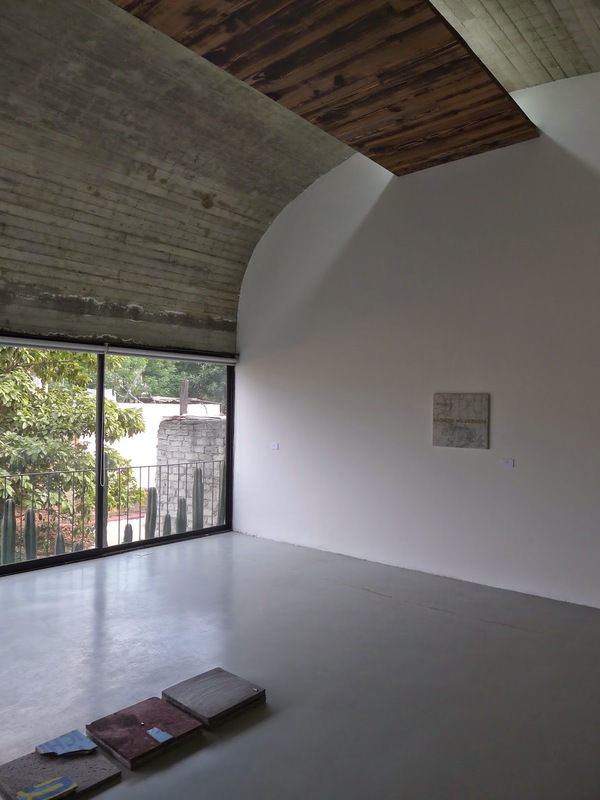 Above and below: Proyectos Monclova, a gallery at Colima #55. Photo above found here. Photo below by Luis Gordoa. Above: Rosetta, one of the top restaurants in Mexico City, known for delicious Italian food and a mix of extremely pretty rooms. Above: An old bookstore on Avenida Alvaro Obregon. 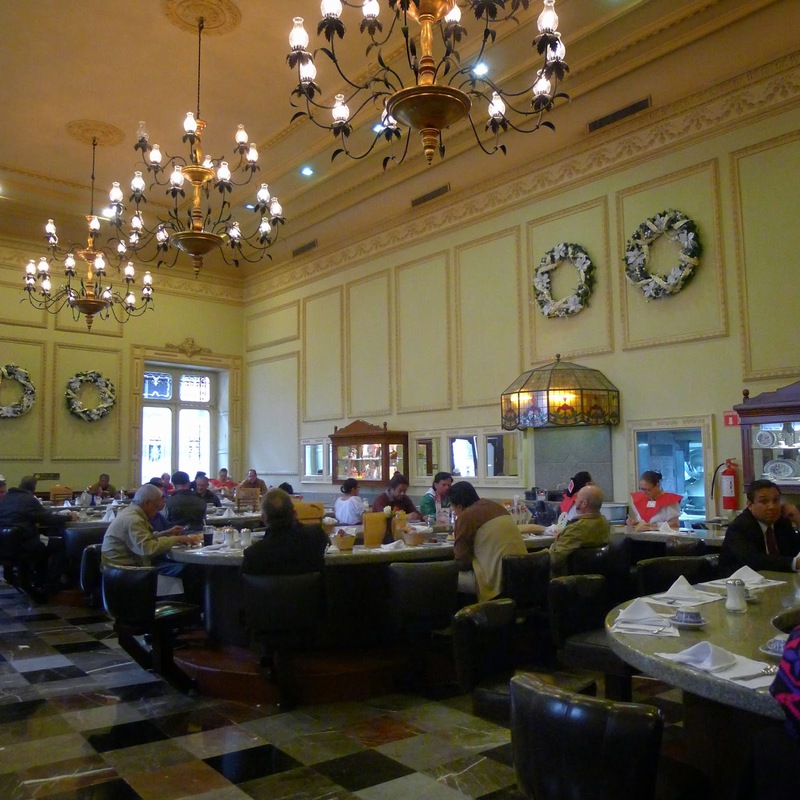 Above and below: El Parnita, a place we enjoyed for lunch. The owner, Bertha Acra, shown below makes her rounds and checks in with all the guests, making everyone feel personally welcomed. 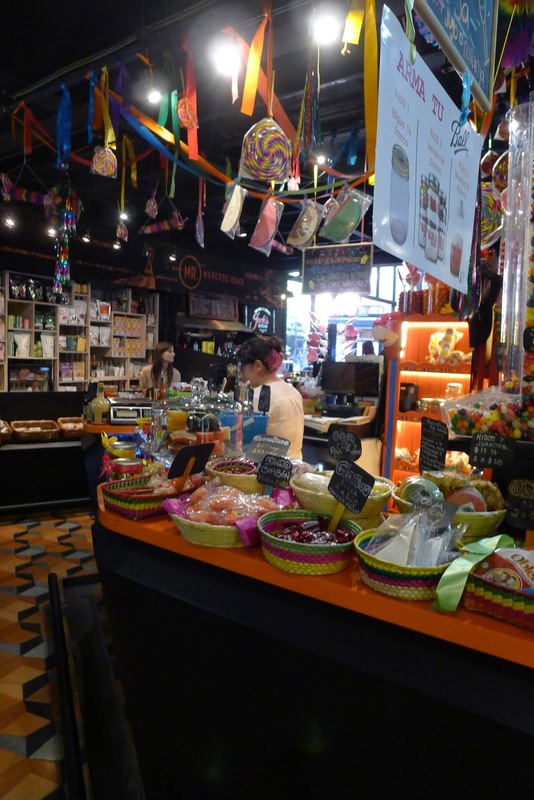 Above and below: A new addition, the Mercado Roma on Calle Queretaro, is an upscale marketplace. Above: Fresh juice near Ave Chapultepec. 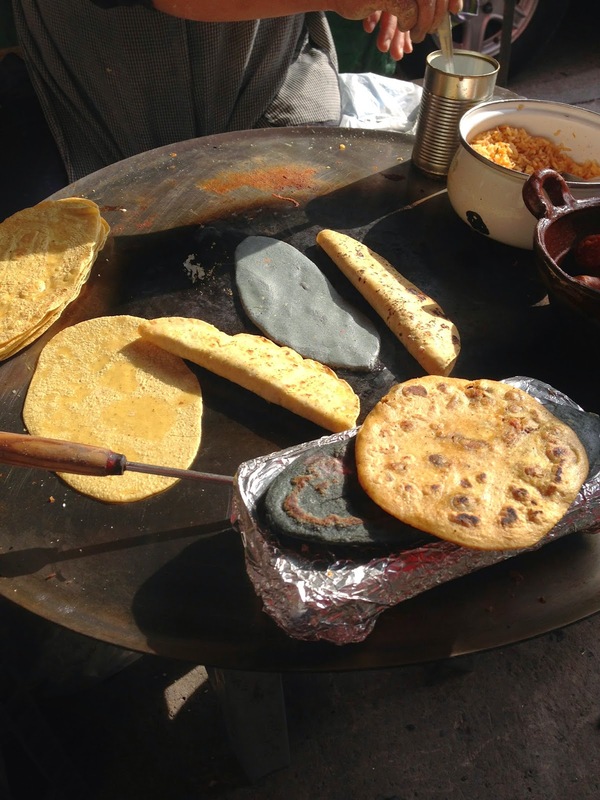 Above: Street food we enjoyed on Burdeos near Reforma. 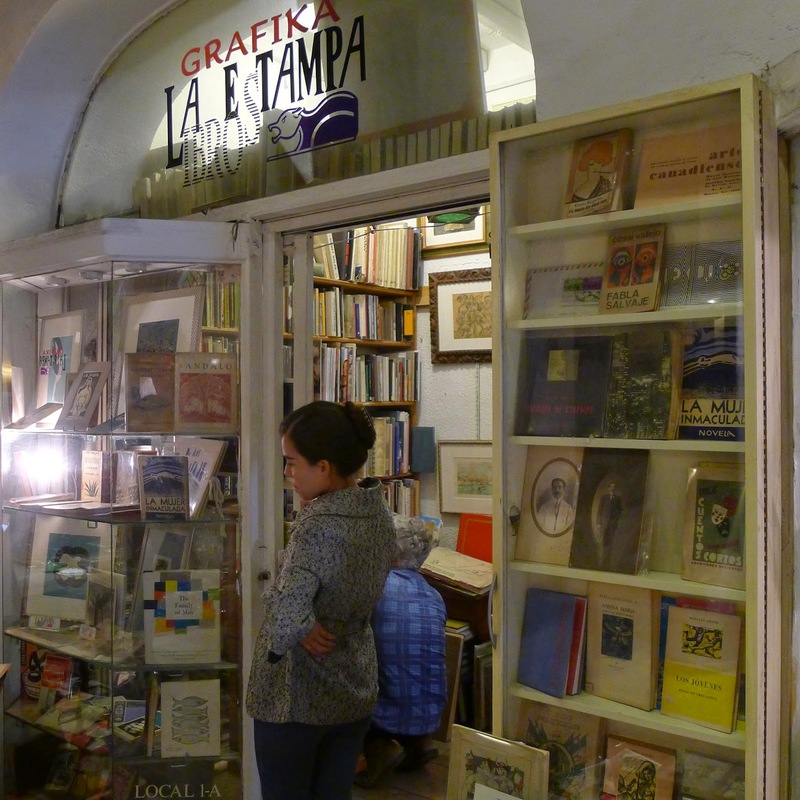 Above: Grafika La Estampa Libros, in Plaza del Angel, an antique mall in the Zona Rosa near Roma Norte. A vintage book store with an excellent selection. Below: A book I found there. It was originally published in 1948, and has an Alvin Lustig cover. 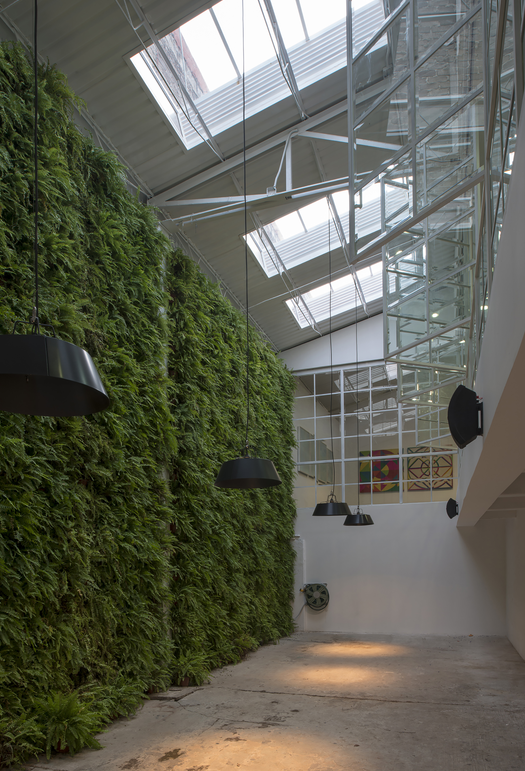 Above: In the south east part of Colonia Roma is an artist's space called Lulu. There's a red door with no sign at Bajio 231 near the corner of Manzanillo. 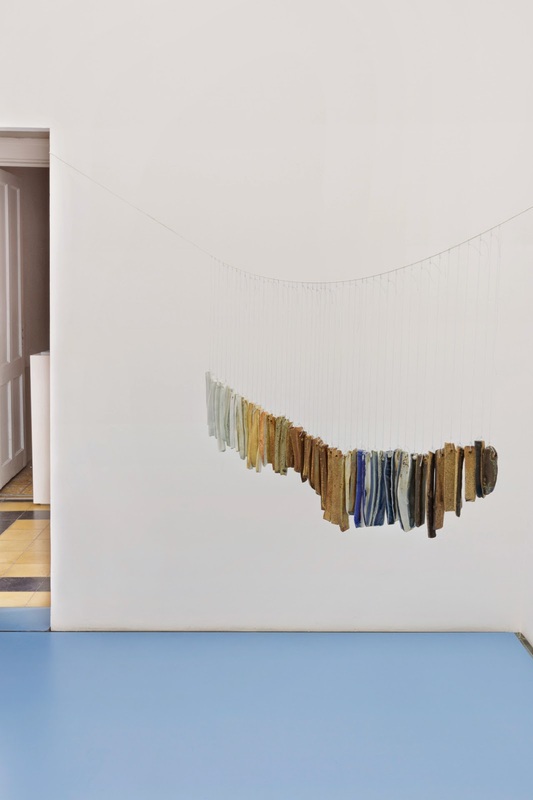 It's run by artist Martin Soto Climent and curator Chris Sharp. The show I'm including above is by Kate Newby, an artist I saw for the first time as part of a group show at Laurel Gitlen in NY. Call Lulu before you go over, as they're mostly open by appointment. Photo by Isaac Contreras. 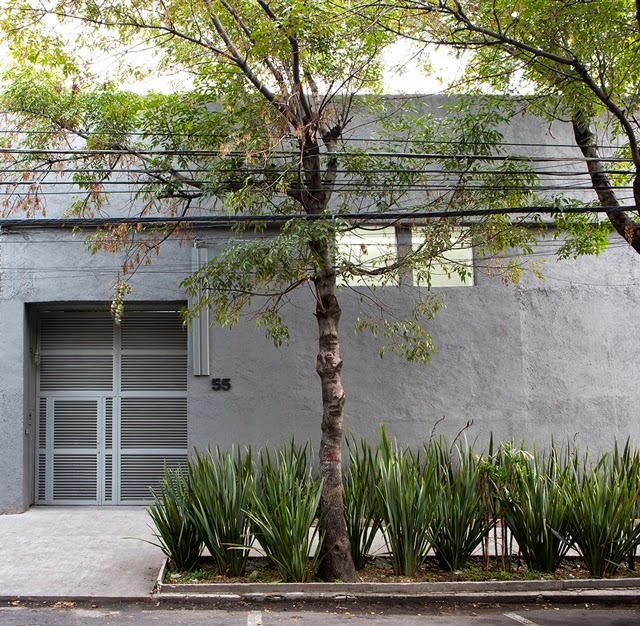 Close to Chapultepec park the neighborhood of San Miguel Chapultepec is home to Casa Barragan, Labor Gallery, and the Kurimanzutto gallery. I'd like to spend more time wandering around here...it feels like a place with a lot going on. Above: Entrance to Kurimanzutto gallery. Above: When you look up from the controlled space of the gallery courtyard you can see a framed view of the apartment building next door with it's laundry and life adding to the character of the gallery space. 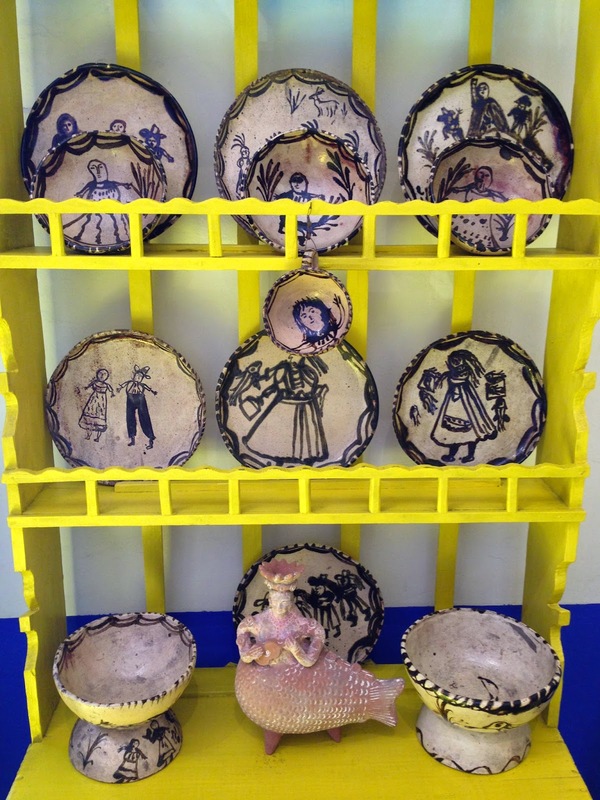 Above: Work by one of their artist's Abraham Cruzvillegas. 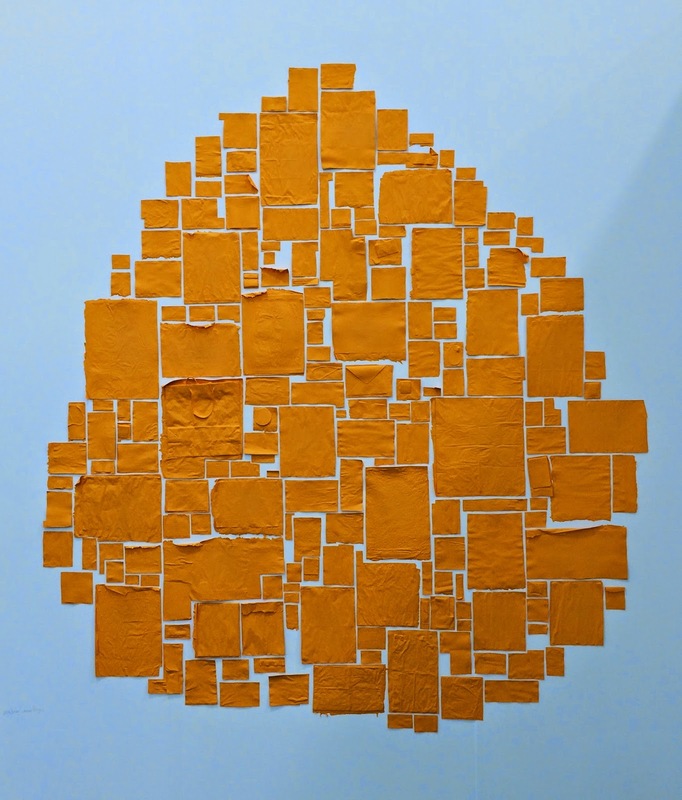 He's taken bits of paper and envelopes and trash and painted them all the same golden color, arranging them into a single composition. Above: Across the street from the Kurimanzutto gallery is a lively cafe, La Ventanita, serving delicious thin crust pizza with unusual toppings. In the back was a juried art show called Salon Acme #3, set in several buildings around a courtyard...surprising and great spaces. Below: Colorful mosaic tiles on the facade of an apartment building. 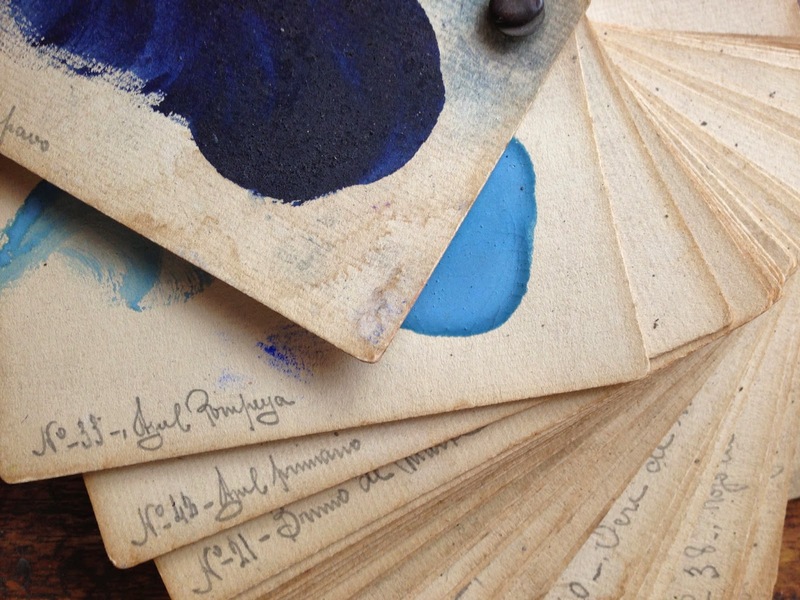 The irregular edges make them look as though they're quickly brushed on in watercolors. 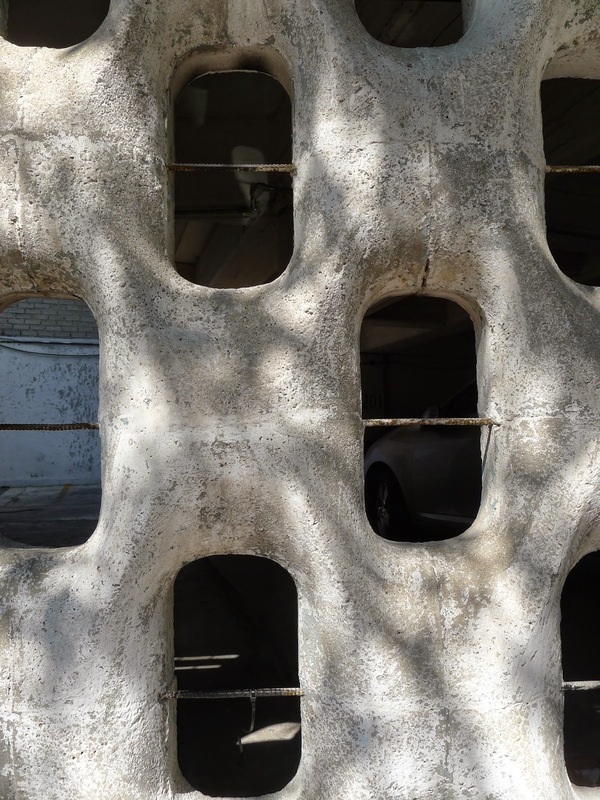 Above: This artistic cement work lets light into a parking garage. 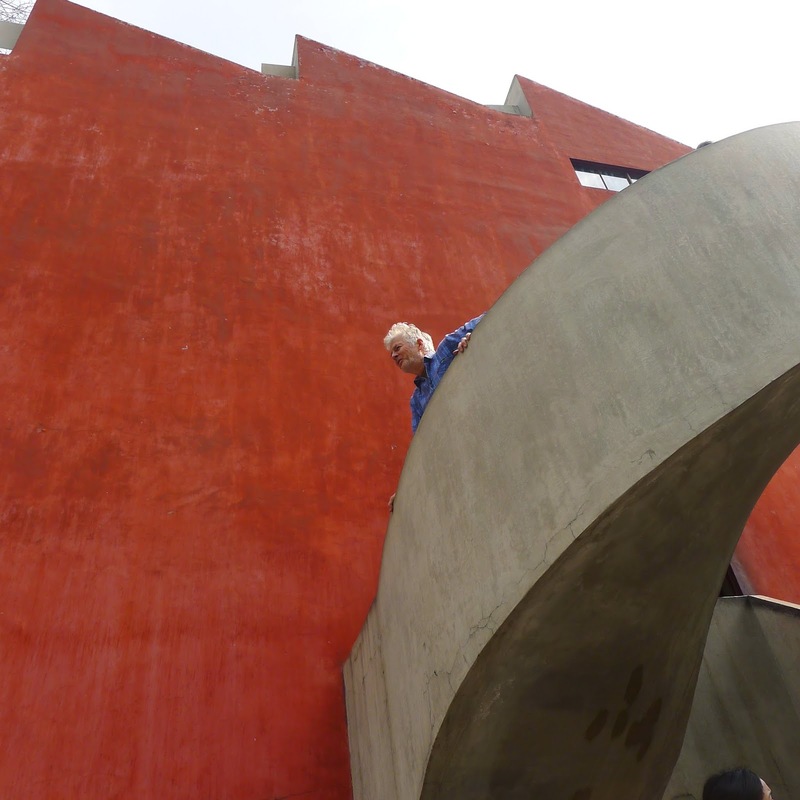 Above: After having looked at pictures of Luis Barragan's architecture for so many years it was exciting to finally be in the spaces he created. 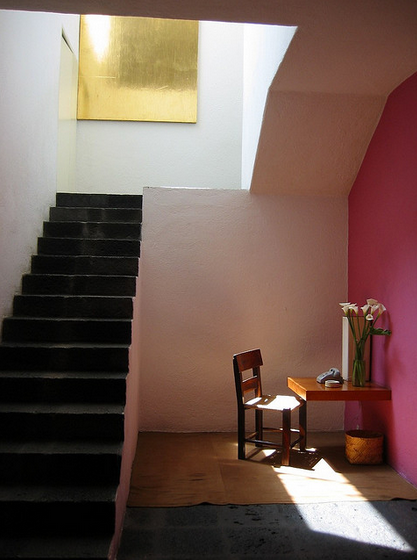 Barragan was the second architect to win the Pritzker Prize, and his home, built in 1948, is a UNESCO World Heritage site. This is the first room you enter in his home, connecting several of the downstairs rooms with stairs to the 2nd level. The gold painting shimmers with reflective light and makes the room glow when it's hit by the sun. 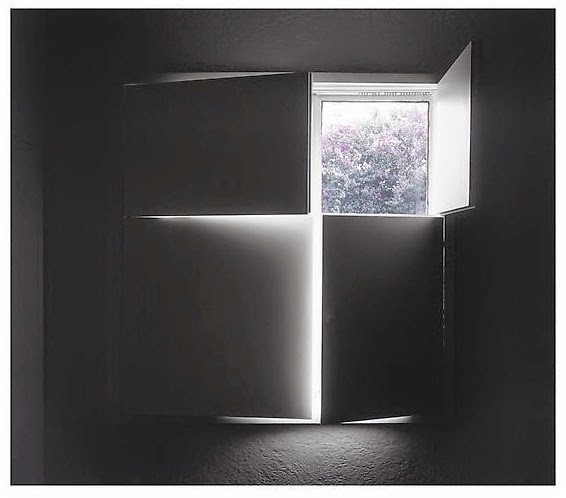 Barragan commissioned it from the artist Mathias Goeritz for that purpose. This photo by Rene Burri is the best view I've seen of the room. Above: This is part of the living room. There are actually two other dining rooms, and I think this table is intended as a place to study, to look at images he'd rest on the display cabinet on the left. The window has the cross motif, which seems intentional given that there's a great deal of religious imagery in the house. Above: The wood beam ceiling extends over the study, library, and the living room with walls between that don't meet the ceiling, giving a sense of openness. Apparently it was typical when the house was built to plaster the ceilings, but the exposed wood reminded Barragan of the house where he grew up. Above: These stairs lead up from the library. Photo courtesy Casa Barragan. Above: A traditional craftsman made the stool. All the carpet is this mustard color. Above: The white walls glow yellow thanks to the yellow glass in the skylight. 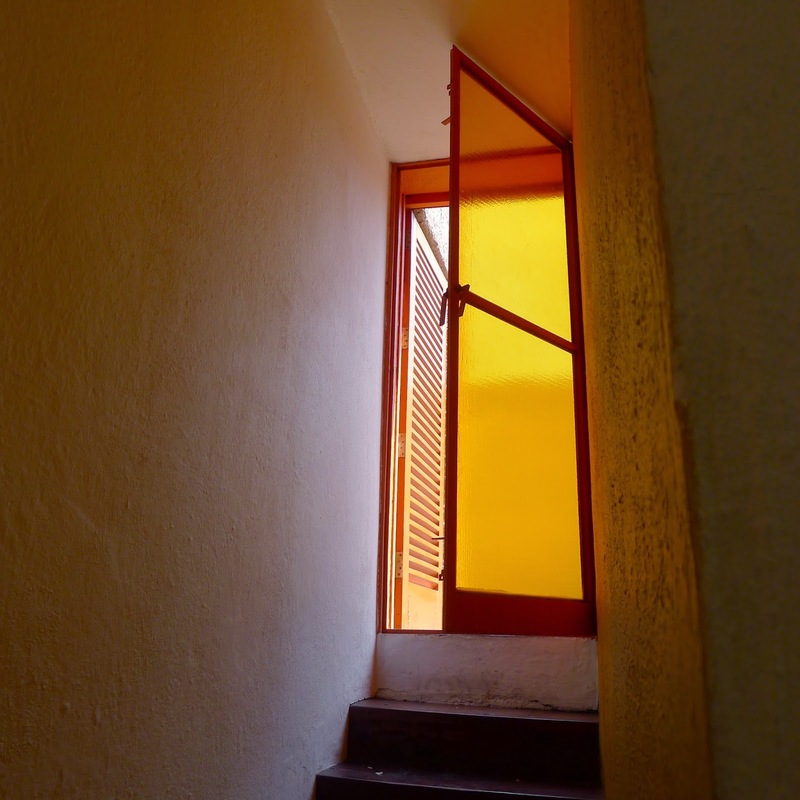 Above: The glass door to the roof deck is yellow giving a mysterious glow to the interior stairs when seen from the adjacent room. 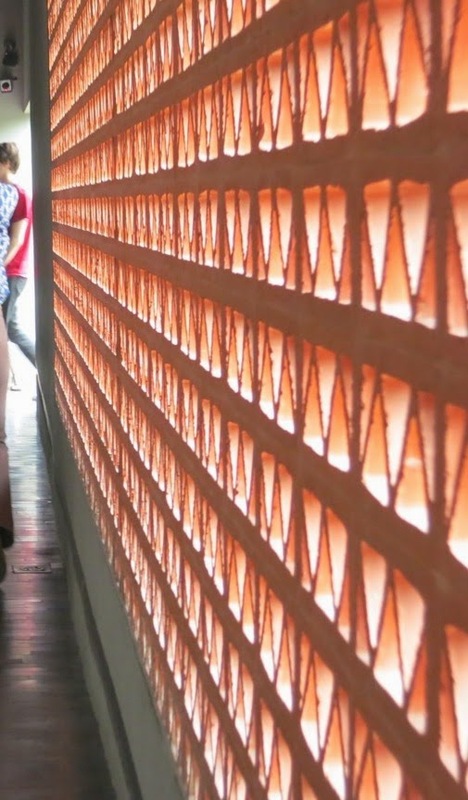 Above and below: Orange, hot pink, and white create strongly contrasted planes on the roof deck walls. 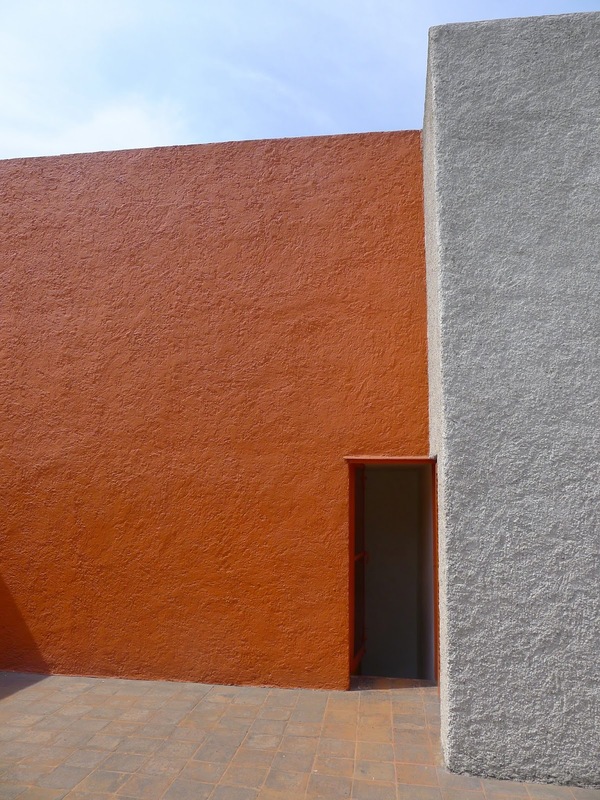 Barragan liked the surrounding walls to be tall so as to frame the view of the sky rather than to give an outlook on the city below. 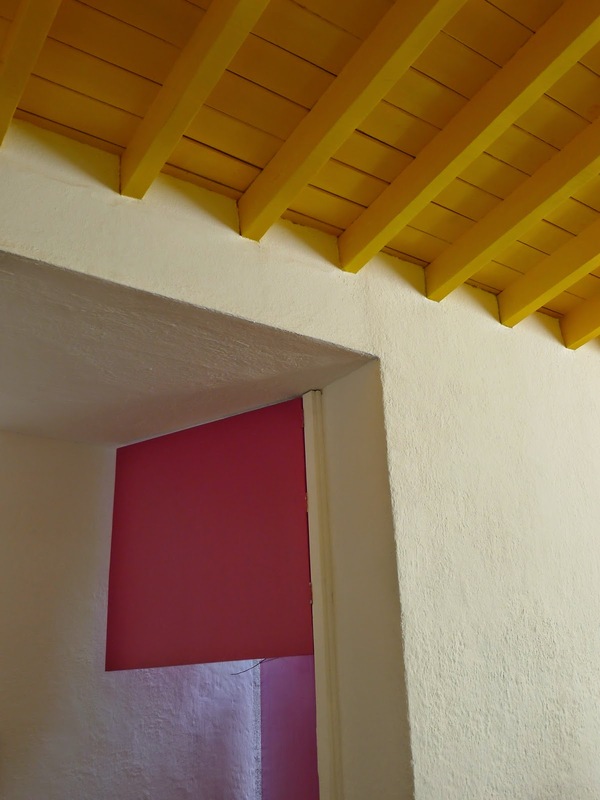 Above: In the room Barragan worked in, he painted the wood ceiling bright yellow. The pink door leads to the garden. 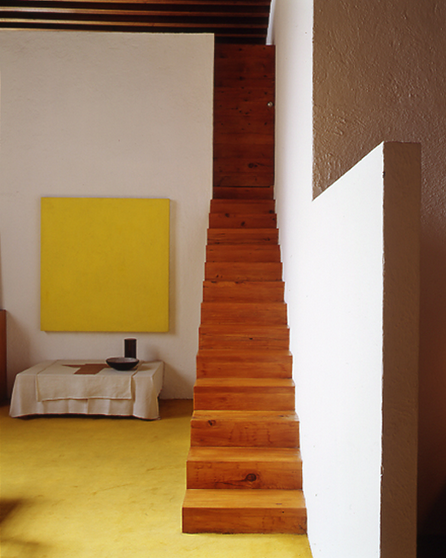 Above: Photo by artist Luisa Lambri "Untitled (Barragan House #33)", 2005. This is a window in the guest room. 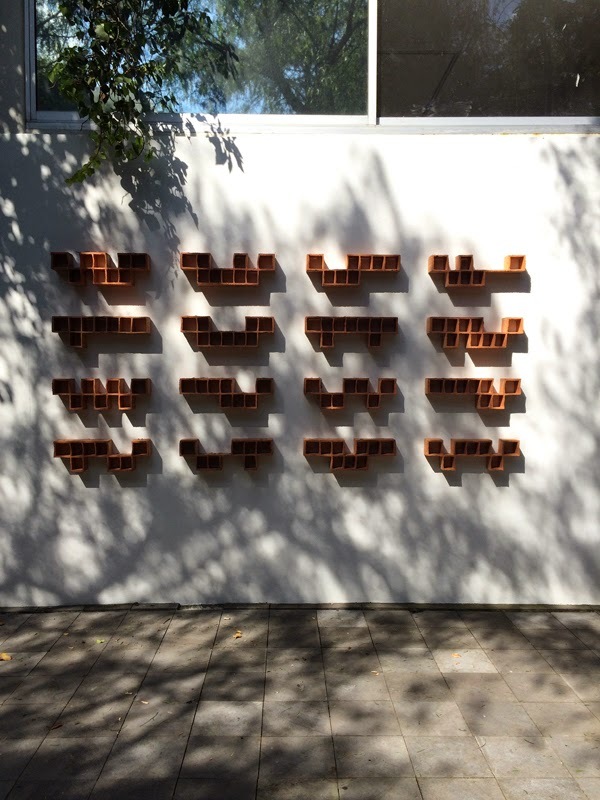 Above: Across the street from Casa Barragan is the Labor Gallery. These steps lead to a rooftop garden from their courtyard. 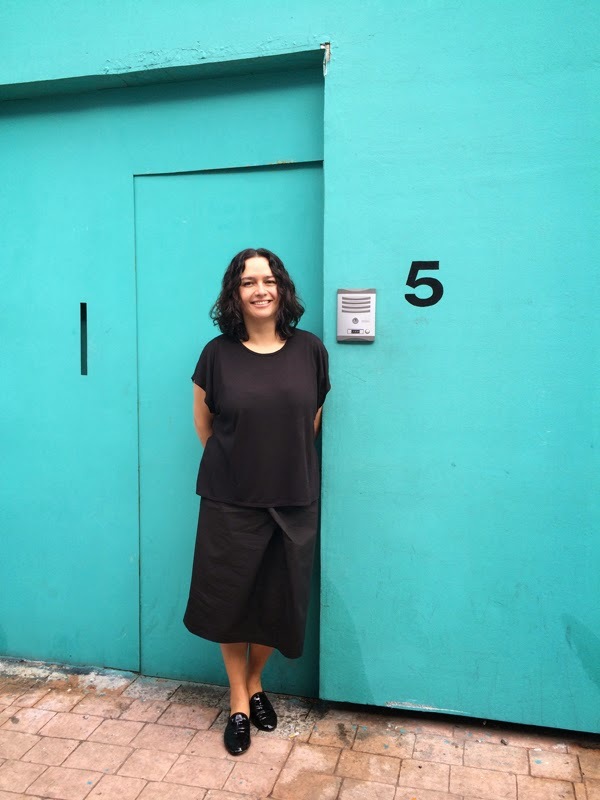 Above: Pamela Echeverria of Labor Gallery. Found the photo here. Above and below: At Labor, work by Hector Zamora, "Protogrometria, Essay in the Anexact". Zamora has taken a utilitarian material and made you see it and think about it in depth. 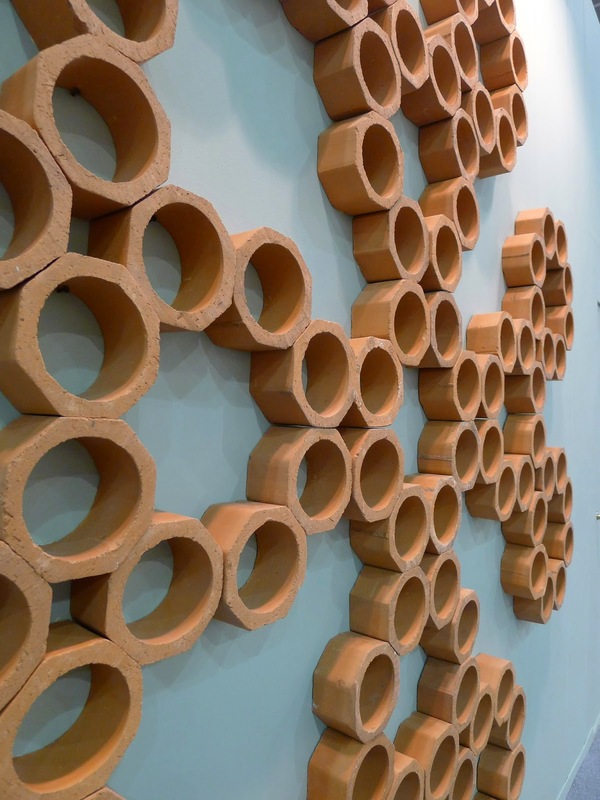 The focus on the terra cotta brick makes you think of it's history, the people that make it and build with it, the possible combinations of the simple forms, and it makes you notice it everywhere else after seeing his work. Photos courtesy the gallery web site. 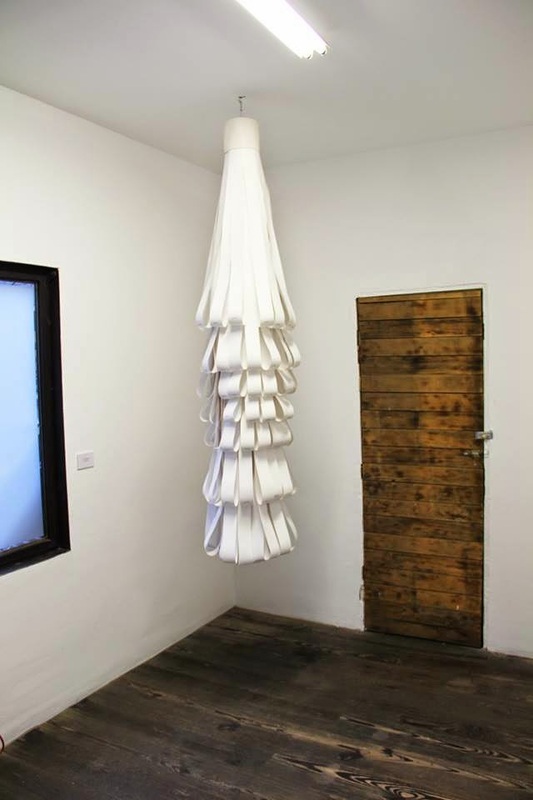 Above: I found this piece, by Hector Zamora at the Zona Maco show. Above: Use of open brickwork in vernacular building. Above and below: Use of open brickwork in the Downtown Hotel. 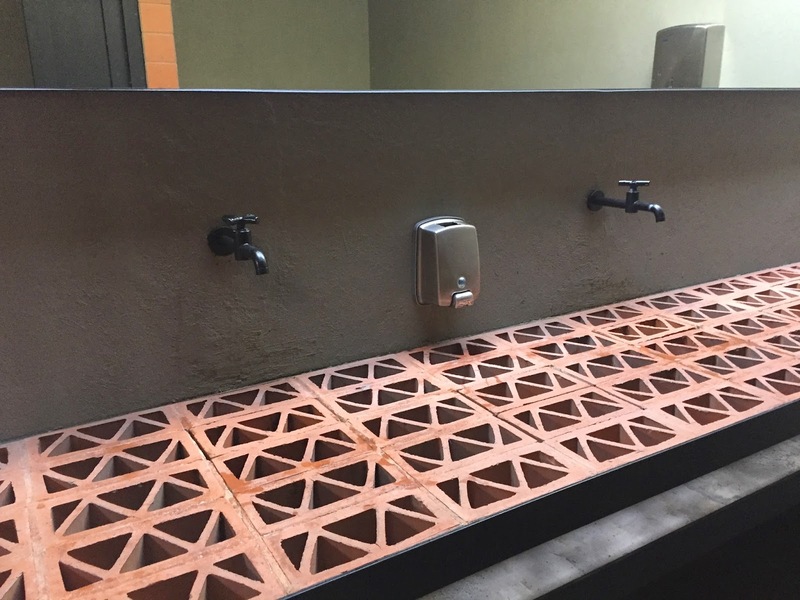 The brickwork is used creatively throughout the hotel, dividing spaces within the rooms, around the poolside bar, and even in the sink. 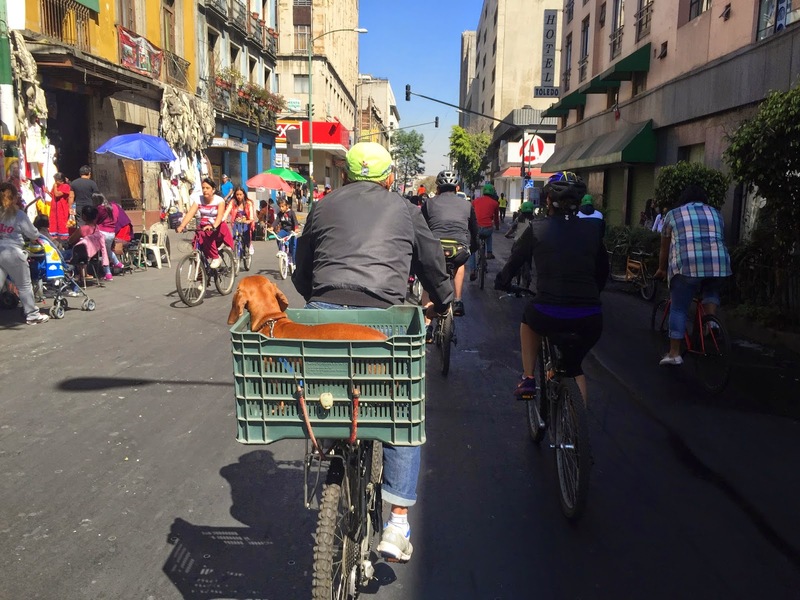 Above: On Sundays the central street, Reforma, and part of the center, is closed to cars and bicycles take over. The riders are shown here in the Centro Historico. 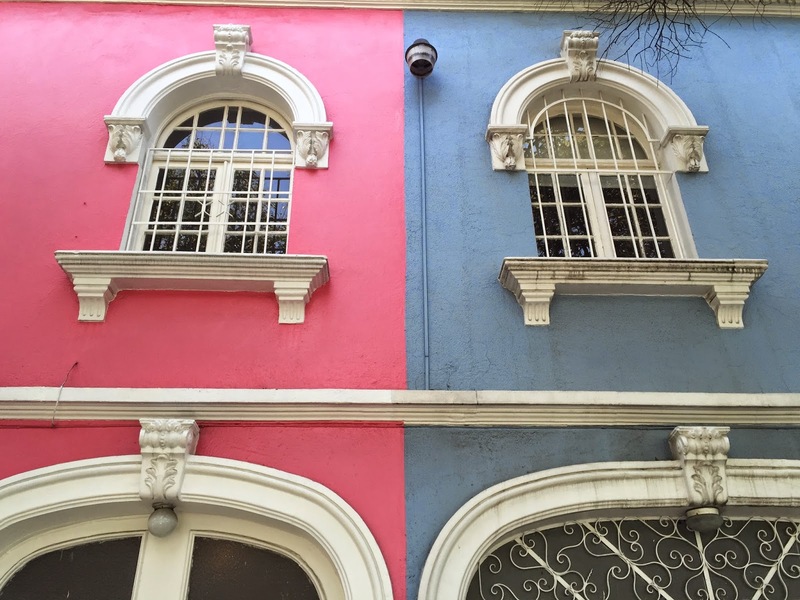 Above and below: Tile work enlivens the facades of these Centro Historico buildings. Above: The Casa de los Azulejos, or "House of Tiles" is an 18th century palace, decorated with tiles from Puebla. Since 1917 it's been owned by Sanborns, the flagship of their soda fountain and drugstore chain. 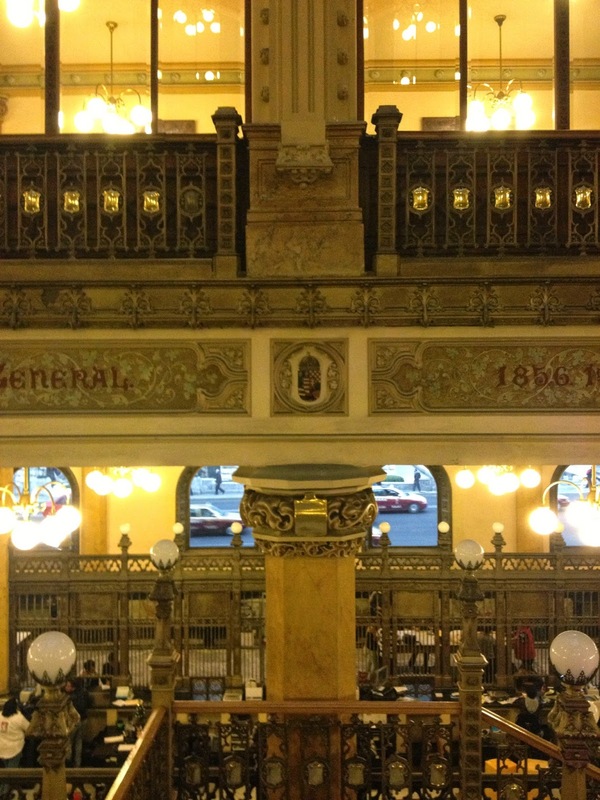 Above: The soda fountain at Sanborns. Above: The Palacio de Correos de Mexico is still functioning as the main post office. Above: These decorative candies are not to be found in the sweet shop but rather in the Museum of Anthropology seen in the photo below. 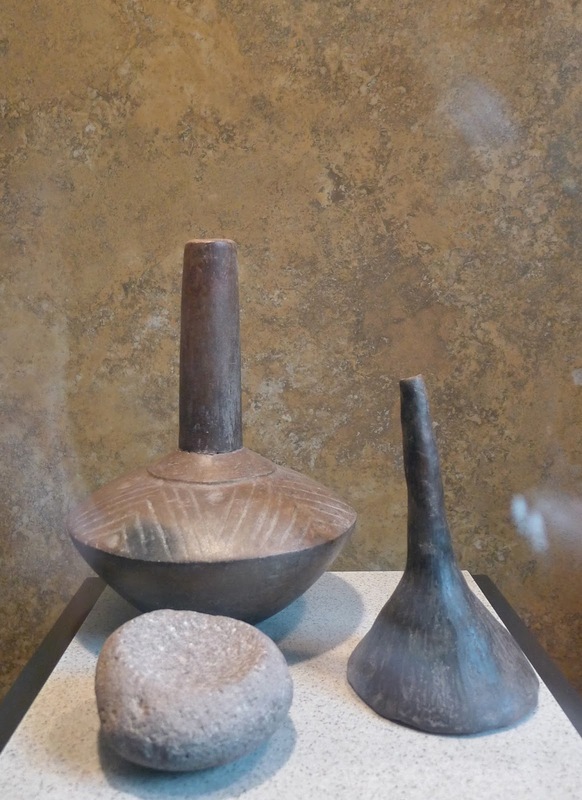 I found them in a wing showing traditional crafts that are an ongoing part of the culture. 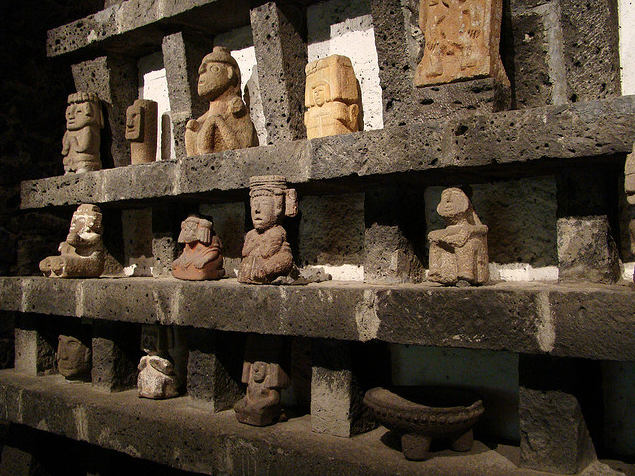 Above: The Museum of Anthropology interior courtyard. A fantastic museum which I can only hint at here. 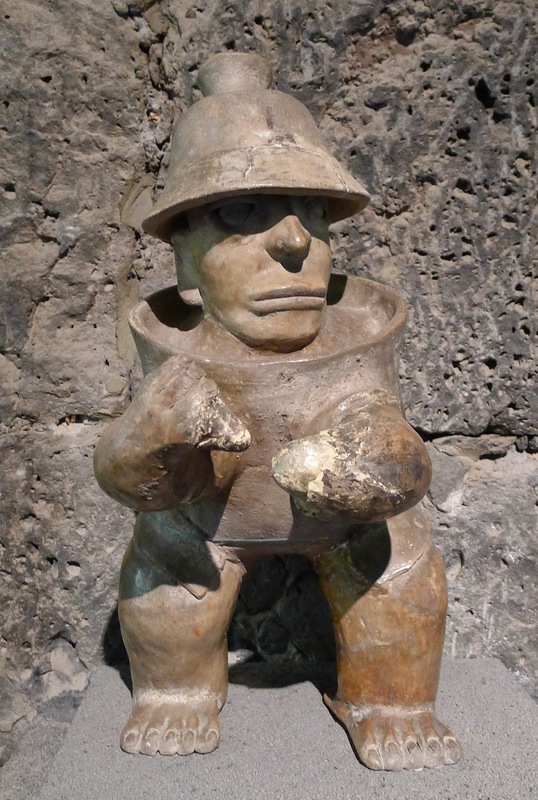 Below: And now I think I've come full circle...an ancient sculpture that reminds me of the playful spirit of the Chaves figure that started this post.